Spicy food is a particular favourite. Both of my parents enjoy hot cuisine, but I think their genes fused and went haywire with me. Once when I was about 10 or 11, we were eating in a Chinese restaurant and I ordered curry chicken very spicy. Well, they made it for a little white boy and it wasn't very spicy, so I asked my Mom to get them to make it hotter. They brought out a dish of red chili sauce and looked on in horror as I dumped the whole thing in my meal. Tasted good! In a bit of video we never ended up using, Adam D. from Killswitch Engage and I took the Man Versus Food challenge and ate the world's hottest curry. I've never heard that man speechless before or since...then again I took off work the next day. And of course you remember my entry on The Ingredient. 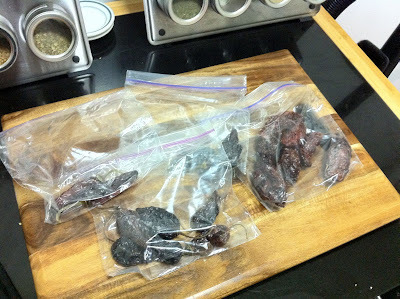 Well, earlier this week I went to the Union Square Greenmarket to see what was available and make a dinner out of it. That entry will come in a day or two. I met up with the Thrifty Sifter and hit an awesome tomato and pepper stand right by the subway entrance. 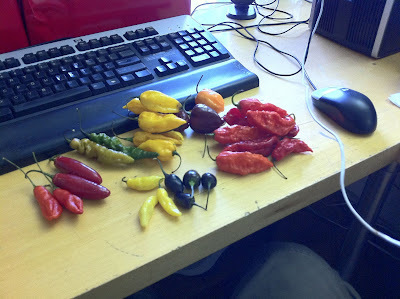 The smell of tomatoes was quite strong inside the station earlier that morning and compelled my later visit, where I discovered they had a wide variety of fresh chilies, including the famed Ghost Pepper, the hottest pepper in the world. So of course I bought a whole carton of those and an assortment of other chilies. 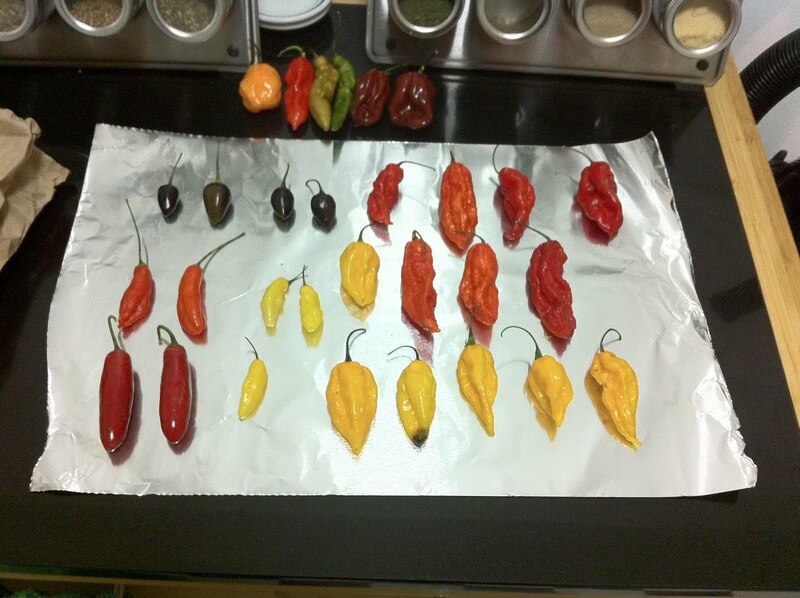 That stack of red ones on the right are the ghost peppers. Now, love hot food as much as I do I still only cook a couple of spicy meals a week. So we're going to dry these bad boys. 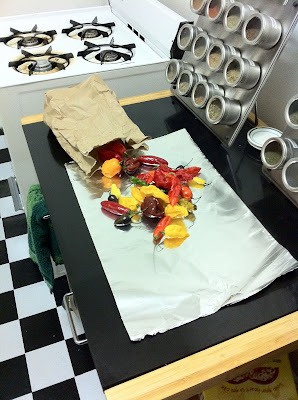 If you always wanted to know how to dry chili peppers, it's pretty simple. Essentially you can do these overnight or all day on a weekend. Since the temperature is fairly low there's not much of a fire hazard worry, but do make sure you have smoke and carbon monoxide detectors that work just in case. Also, in this entry I'm clearly drying a few different sizes of peppers. I would not do this if you plan on leaving them unattended as they dry at different rates. Wait until they turn a deep red or brown and brittle, then they're ready. The peppers off the tray I'm saving for fresh use this week. Yes, one is a ghost pepper and yes, I'm going to eat it on video later this week. 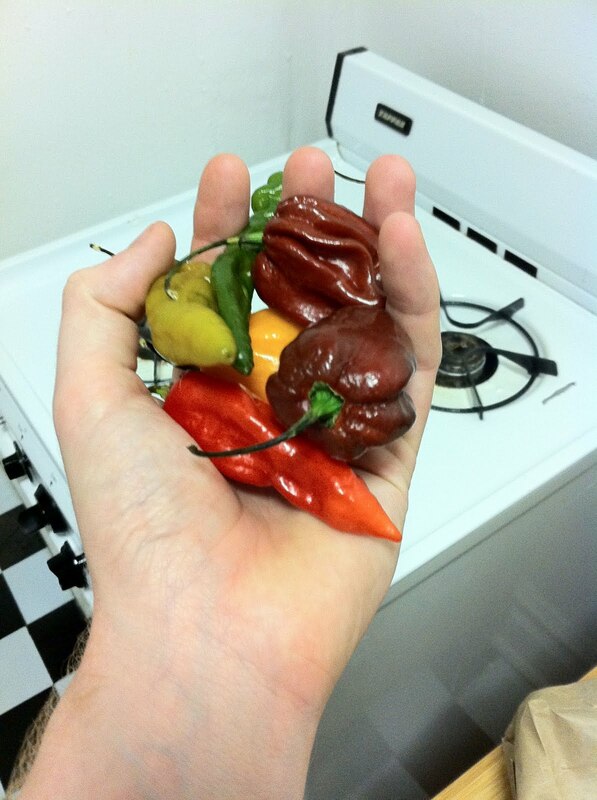 I don't remember the variety of the yellow peppers, though it is one of the jolokias and is only slightly less hot than the ghost pepper. Those greenish-black little ones at the upper left are called black prince. You'll probably notice the familiar orange of a habanero peeking out from the bottom of the pile there and right next to it are a new one one me: chocolate habaneros. I'm assured the name is purely descriptive of the colour. The two green ones on the left are also new to me and I can't find a link about them anywhere yet: lightning. For dinner tonight I included one of these raw. The flavour is subtle, without the sort of bite a habanero might have. I was assured they were very spicy, but it's a rather slow build that allows you to really get the taste of the pepper going before your sinuses clear out. And here we are after a few hours' heating, packed up and ready for later use!